I left a job with the intention of taking 6-12 months off to take some trips, work on the house, and execute an ambitious volunteer project. Just to be safe, though, I maintained a Premium LinkedIn account to a Premium account, specifically, Job Seeker. I went about the things I wanted to do and exactly 12 months later I ramped up my job search. I set up various searches and alerts, reached out to a select group of contacts, and started going through my personal contact entries and evaluating whether or not to add them as LinkedIn connections. I was a job search machine. Then I hit a speed bump. Less than two weeks into March, I started seeing a strange message and most of my search results blurred out. Had I broken the Internet? Note 1: the redaction with black out is mine, the blurring is LinkedIn's. Note 2: I had a Premium account when this happened. If you have Business Plus, Recruiter, or Sales Navigator, then you won't hit this limit. ...a limit based on search usage. 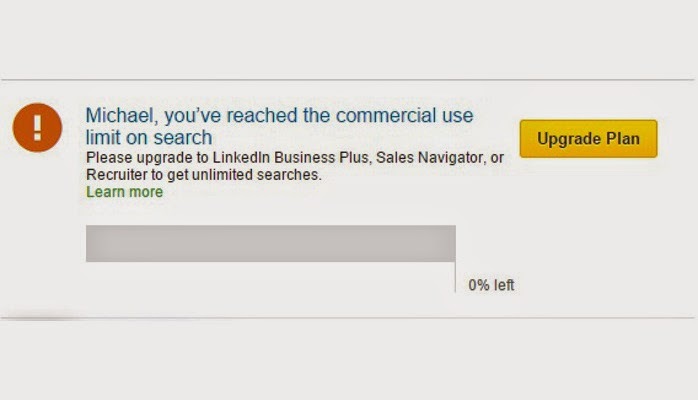 If you reach the commercial use limit, your activity on LinkedIn indicates that you're likely using LinkedIn for commercial use, like hiring or prospecting. This limit is calculated based on your search activity since the first of the calendar month. A progress bar appears in your search results when 30% of your searches are left, and continues to remind you in 5% increments. After you've reached the limit, you can continue to search, but will see a limited number of results. Your free monthly usage resets at midnight PST on the 1st of each calendar month. The limit doesn’t affect your ability to search 1st degree connections. Even if you’ve encountered the limit, you may always search your 1st degree connections on your connections page. Note: We're not able to display the exact number of searches you have left and we also cannot lift the limit upon request. Also note the warnings may not display if you run through the full amount of searches too quickly. A second inquiry with support did not produce much useful information, but they did emphasize the ability to search Connections freely, a feature I had not really used enough. The key reason I was using the LinkedIn search was so I could zero in on the right person with their filters. But Google search is pretty powerful and enables a similar approach, especially if you know anything about that person's past companies or schools. Let's say you were in the Army with me and were trying to find me on LinkedIn. You can type "michael casavant linkedin army" into Google and, low and behold, you will find a link to my LinkedIn Profile (because I have listed my Army service there). However, if you click on a link that says something like "View the profiles of professionals named Mike Casavant on LinkedIn" then you are simply going to be routed to a LinkedIn search and (presumably) burn your quota anyway. Note: Very recent changes may not show up in Google searches right away. For example, I changed my current job yesterday and a Google search for "michael casavant linkedin argo" is saying that "argo" is missing from the hit for my profile (but it still finds me because my name is unusual). This approach actually works really well and it is fast becoming my default first step. 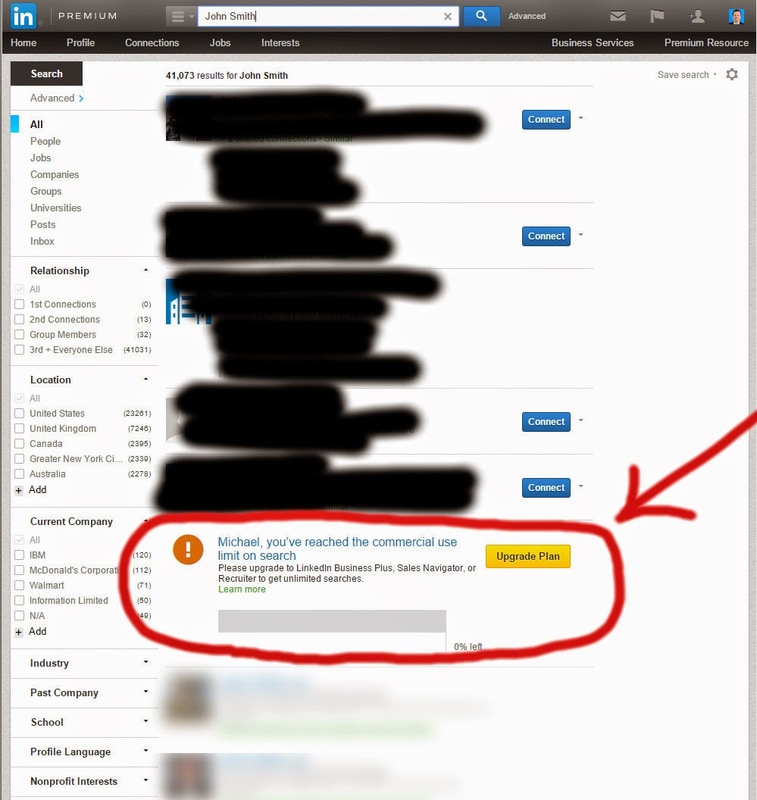 If you are trying to confirm/find a contact you already have in LinkedIn, there is another path. If you log into LinkedIn, you can go to Connections, which allows you to search only your connections. This does not count against the search quota. It's also a powerful way to search, because you can be more free with the keywords as you are only looking at your contacts. E.G., searching LinkedIn for "marketing" is not very useful, but searching your connections for that can be an effective way to find which of your contacts has marketing experience. Look, I don't begrudge LinkedIn trying to make a buck. However, they clamped down too fast, in my opinion, so fast that upgrading to remove the limit was immediately off the table, in my mind. Lots of things are monetized, but when this limit showed up, it was like I could feel them trying to pick my pocket. It actually inspired me to turn off my Premium subscription. It's still a good product, but this feature could use some refinement.